It's been a big week for VR but Microsoft wants to make sure you don't forget about its $3,000 AR headset, HoloLens, which is now shipping to developers and enterprise customers. HoloLens got plenty of attention at Microsoft's Build 2016 conference in San Francisco. Microsoft announced that Galaxy Explorer, the winner of its Share Your Idea competition, will be coming to the Windows Store with the code made available in GitHub. We were also treated to updates on two of the most interesting HoloLens experiments so far - Case Western's anatomy education tools and NASA's OnSight which is coming to the Kennedy Space Center, complete with a holographic Buzz Aldrin, as an exhibition for the public from summer 2016. Windows Insiders in the US and Canada have been able to apply for two devices, priced at $3,000 each, and anyone who applied when it first opened should expect the futuristic helmet to arrive in the coming weeks. In the box, as you can see from the image above, you'll get a headset, along with a carry case, a Bluetooth controller, an AC adapter and a spare nose-arch. 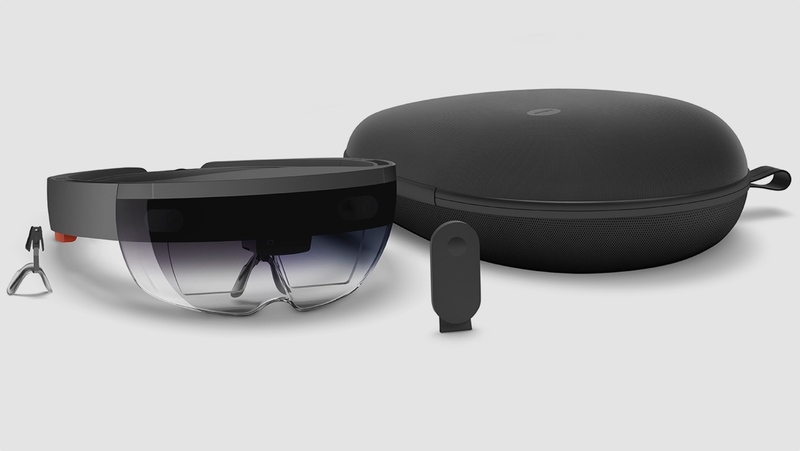 One detail that Microsoft chose not to disclose at this stage is when we can expect a consumer version of HoloLens. So you can still place your bets (Christmas 2016? Summer 2017?) on that. Microsoft is promising that devs who nab a HoloLens early doors will get "immediate access to hundreds of UWP apps through the Windows Store – great and familiar apps like OneDrive, Maps, Remote Desktop, People, Movies & TV, Groove Music and Microsoft Office apps." Microsoft has recently spilled the beans on a few more of the HoloLens' tech specs, plugging a few holes that were left after the initial announcement last year. HoloLens is powered by the Microsoft Holographic Processing Unit (HPU) and Intel 32-bit architecture, and there's 2GB of RAM on board, along with 64GB of storage. Battery life is stated as 2-3 hours for active use and the headset weighs just shy of 580g. Part Google Glass, part Oculus Rift, part Nintendo Wii U, part helmet from RoboCop, Microsoft HoloLens was billed as "the future of computing" when it was unveiled at the Windows 10 launch event last year. Using the Windows 10 universal apps ecosystem, devs are being encouraged to create experiences containing holograms for the real world. If they've got a spare $3,000 knocking about, that is.